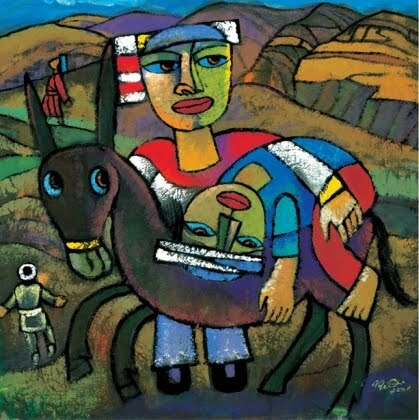 You are most likely pretty familiar with the story of the Good Samaritan. It is one of the most well known of Jesus' many stories. The part of this story that I have been puzzling over for the last few weeks is the Inn keeper. Who is this remarkable character that takes in this poor stranger that the Good Samaritan has bandaged up? What makes him agree to take the man in? Why would he spend beyond what he was given to look after this man? Why would he trust the Samaritan to return? 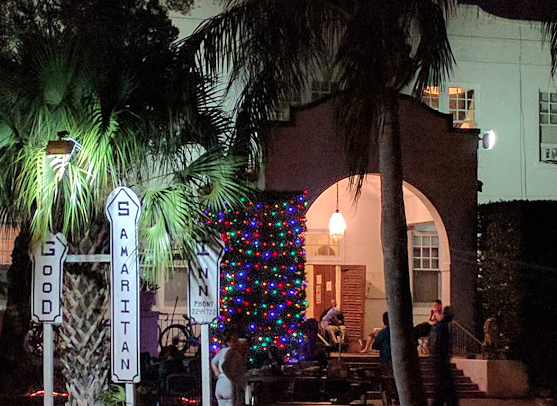 I think this story has been on my mind because we have been spending more and more time at one of our favorite places in Tampa called "The Good Samaritan Inn." Many recognize the name of the place as reference to the story but I don't think many pick up on the reference to the inn itself. It refers to the inn where those who have been rescued and cared for are brought until the Samaritan returns. We were there quite a bit over the last week and it is so full of beautiful people, many of whom really are in need of the kind of care the inn keeper in the story was asked to provide. It is a wonderful place to gather as family and "do likewise" as we offer mercy to one another. Last Saturday, January 28th, we took our mobile unit out for the first time and we were honored to christen our coach at The Good Samaritan Inn. We had such an amazing time reconnecting with so many of our neighbors that we used to see at our Family Room just two blocks south of the Inn. It was like a family reunion and we were all so grateful for the grace of one another's presence. Then one of our teams shared dinner at the Inn on Tuesday night, this meal has been at the Inn every Tuesday for the last 6 years. 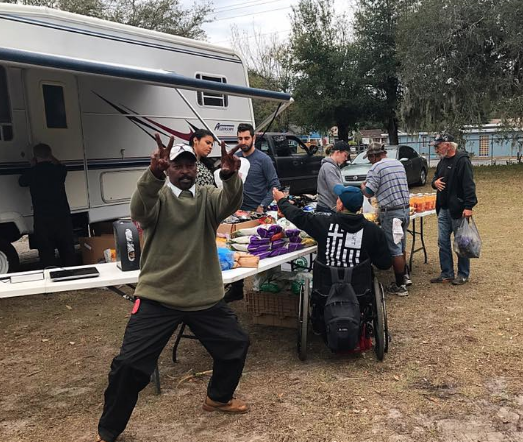 It was this meal that established many of the relationships we have with the residents as well as our relationship with the owner of the Inn, who is allowing us to come and serve there in a much deeper way since the closing of our drop-in center. Wednesday night, though it wasn't at the Good Sam, is still a highlight from what was an amazing and full week. We gathered many of our core folks for our weekly Family Time gathering; we laughed and ate together. This time is such a beautiful and rich space where we pause from hospitality to turn to love and care for each other. Then on Thursday morning several of us went to The Coffee Shop, a new drop-in center that Gracepoint just opened on Nebraska Avenue. We are so excited about this place as it is an answer to prayer. We were sad to know that in closing our center there were no other options for many of our friends to get showers or have a place to rest during the day. Just over 2 months after closing, the Shop opened up offering showers, laundry, coffee, a place to rest and so much more! We are so grateful for others in the work with whom to share the load. That same evening, as with almost every Thursday night for the last 8 years, The Banquet was served. They have recently relocated the dinner into The Good Samaritan Inn, deepening our commitment to and work with the community there. Saturday was a full day too. A handful of us gathered that morning to clean, prep, and plant the Tampa Eden Project's Ybor Street Community garden. 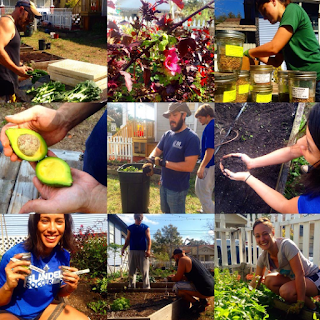 It was a beautiful and relaxing day of sowing seeds and enjoying one another, as well as the perfect Tampa weather. 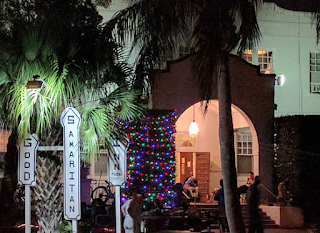 Then on Saturday evening we held our monthly open mic and potluck dinner known as The Conscious Party, now at the Good Samaritan Inn! It feels so right to host this event there as residents from the Inn have been among our most faithful Conscious Party attendees since it began a little over 7 years ago. Finally, on Sunday, our board of directors gathered to review our strategic plan and the tasks ahead of us for Q1 & Q2 of 2017. It was a week full of going and opportunities to do likewise. So if you pass by our old address and wonder about the Well, please know that we have not gone anywhere and are every bit as committed to the vision of seeing needs met, bridges built, and our city made whole. Just a few weeks ago Tampa was in the international spotlight for a few reasons. One reason was our city had the honor of hosting a college football national championship playoff game. The other reason wasn’t unrelated; it was a story that went viral about Food Not Bombs volunteers being arrested for sharing food with the homeless. As the story grew there were many who wrote articles trying to protect our city’s reputation and push back on the narrative that FnB volunteers were persecuted saints. Even the Tampa Police Chief Eric Ward published an editorial in the Tampa Bay Times offering what amounted to a wonderful political response. The thing is though, while there may be details to the specific event that could potentially nuance how one understands it, the story itself, became a powerful symbol, which is evidenced by the fact of it going viral. Symbols, like myths, transcend concrete details and take on a broader Truth that we immediately recognize as such. The image was that of people being cuffed as they attempted to love/serve a population that Tampa was trying to repress from conscious attention while hosting the game. As is often the case when we repress things, it grew into something tremendous, beyond what they could have imagined. It is tempting for those that are familiar with details to be baffled by the story as symbol. Eric Ward wrote about TPD’s work with the city’s homeless through dedicated liaisons. It’s true, there are a few officers that have been dedicated to functioning as case workers and are doing great work to help folks get off the streets. We have worked with them to serve our people and this is one of the most promising things that TPD does. 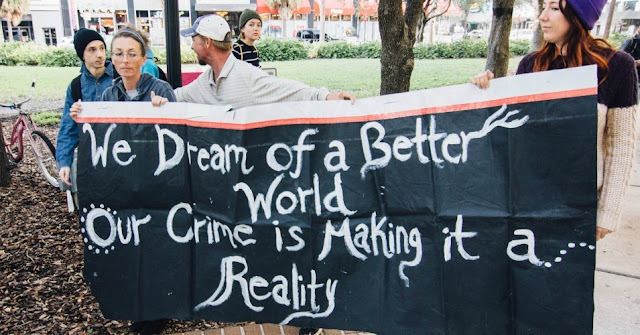 These police have different marching orders and it is substantially obvious when you contrast the way Tampa’s poor are treated by other officers on the force. 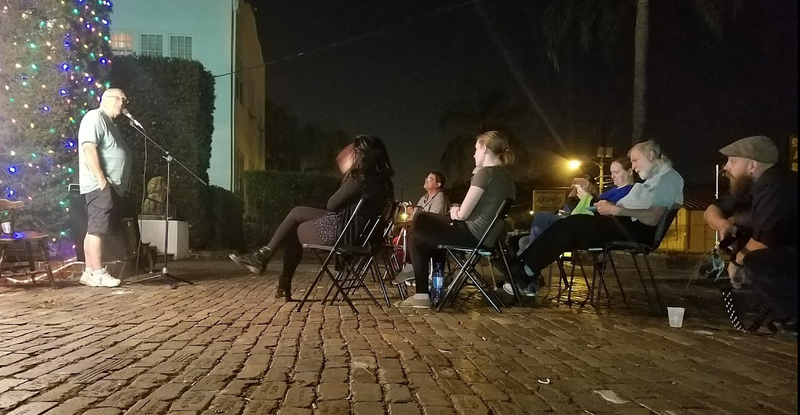 Many of us, who are intimately familiar with this city’s treatment of the homeless and groups that work with them, were baffled that this was a story at all. It’s just another Saturday. I cannot tell you how many families I know who used to go share spaghetti out of the trunk of their car only to be threatened with arrest by Tampa Police. All of them stopped going out because, well, who wants to go to jail? This is why a defiant crew like Food Not Bombs is a necessity. This wasn’t the first time, and I don’t imagine it will be the last. This move functionally broke the pretense and presented to the world, in symbolic form, something hideous in our own spirit. The event as a symbol is powerful, and it is true. It resonates deeply within us. Across party lines, both democrats and republicans, the rich and the poor, responded viscerally to this symbol. It induced disgust. No explanation or detail can undo disgust as a moral judgement. We know and feel this story on the symbolic level and we know, albeit subconsciously, that that same spirit that this symbol represents, is inside of ourselves, and so we recoil. We deny and repress it, just as our city denies and represses the symptoms of it’s own illness. We can raise our fists in outrage at the symbol of handcuffed compassion but when we are personally face to face with those who live in hell, we avoid, we deny, and sometimes, if we are honest, we recoil in disgust. Incidentally this is why law and code enforcement are always running the poor off and threatening to fine or arrest, because we demand it. Their phones ring off the hook with complaints from businesses and homeowners, complaining about the hell, the chaos of the streets, encroaching on their clean and ordered worlds. You see society is about order, it stands against chaos. We want nothing to do with the chaos that is, in all actually the underworld. So we arrest the chaos, we lock it in cages, we shoo it from sight. Our terror of death, our denial of chaos, our unwillingness to acknowledge the symptoms of our corporate illness, compel us to maintain safety, stability, and security at almost any cost. So we become pathological and oppressive. Then there's the fence, another powerful symbol. The Friday before the national championship game, the day before the arrests, a fence appeared out of nowhere walling off a park where many of the city's homeless would spend their days. We walled it off, or quarantined it, like it was a portal to hell. No regard for those who found in that park, a small bit of rest and respite from the chaos. Never mind that so many neighbors of ours, live in hell; socially, psychologically, and economically. The drive for order and our efforts to create our own utopia where there is no mental illness, dirt, or pain, necessitates our blindness to the value of these neighbors, these suffering human beings. A fence, like a wall, is a powerful symbol and I am sure that the gesture communicated our disdain to those for whom it was intended. The city’s message is crystal clear. The power of these symbols should not be overlooked. In our efforts to secure our own heaven, we are creating a hell. These symbols, as ugly as they are, reveal something about our character. They are representative of the story that we are living into. They are manifestations of a collective spirit. It is good that we recoil from them, even if we are recoiling from something in ourselves. We know that another story is possible. So what is the opposite of fences? Bridges that connect rather than divide maybe? Maybe a potlatch in the park is a good symbol for this new and emerging story, which by the way, is an ancient and forgotten one. of sharing, joy, generosity, trust, peace, and community.